Two big games are on the menu today from Gabon as the first set of round one confrontations draw to an end. They will unfold in Port-Gentil the second-largest city of Gabon, and its leading seaport. It is the center of Gabon's petroleum and timber industries and amazingly sits quasi independently on an island with no roads or bridges connecting it to the main part of the country. As one might guess it is spectacularly gorgeous as is its 20,000 seat stadium which is one of the few in the world, if not the only one, to have its own in built hotel. In the first game it will be dejavu from the 1978 finals in Accra where the two last met at Afcon. For Uganda it’s taken them almost four decades to return to the big dance, while the other team Ghana, has been an ever present danger to the rest of Africa. So it is ironical, especially for Uganda, that the Black Stars will once again be their opponents in Gabon. The Cranes coach Serbian Sredojevic, better known by his nickname "Micho" summates it best when he says "I feel honoured, pleased and privileged to be here. We have worked very hard in Uganda to make this happen. Thirty-plus million people have dreamt to have us here”. He knows it won’t be easy against the West Africans who are featuring a team bristling with talent. Danger man and captain Gyan Asamoah is back and so are the Ayew brothers [below] keen on stepping out of the shadow of their famous father Abedi Ayew, and etching their own place in history. Furthermore there is really a lot of pressure on their coach Avram Grant to produce something tangible for the Black Stars fans who want another cup since the last one they hoisted in 1982.But Micho, coy as ever, knows Ghana very well. The Cranes took four points off Ghana in their ultimately unsuccessful bid to qualify for the 2015 Africa Cup of Nations and also held them to a 0-0 draw in Tamale in World Cup qualifying last October. Again fate has them in the same World Cup qualifying group for Russia 2018, so as we said, they know each other very well. Even without the injured duo of Murshid Juuko and Khalid Aucho out and his best player, Africa’s best goalkeeper Denis Onyango, banged up, he fancies his chances and concluded by saying: "The law of averages tells you – three matches the last two years and what happened has happened, but history will not play tomorrow. Past sentiments we must put out. Uganda has no experience in final tournaments.We have watched 19 Cups of Nations since 1978 on television, but now we are here”. Africa Cup of Nations title record holders Egypt begin their Group D campaign against the Eagles of Mali aiming to start the tournament on a good note which will hopefully propel them to an eighth Afcon title. Now coached by Hector Cuper, the Pharaohs are making a return to the African showpiece after a repeated absence. A new generation of players are primed and ready to go to actualise a dream of a nation who haven’t tasted Afcon success since 2010 when the last won the trophy. Mohammed Salah is the leading man in this exciting crop of players. The Roma winger is full of pace, good technical skills and a keen eye for goal. He won’t be alone as Arsenal’s Mohammed Elneny will provide support in the midfield. Stoke City’s Ramadan Sohbi and Mahmoud Trezeguet are also players to keep an eye on in Cuper’s free flowing style. [above] who celebrated his 44th birthday on the eve of the game against Mali. Ahmed Elmohamady, Ahmed Fathi and Mohammed Shafi are the old heads of the squad who were around last time Egypt won the title. Egypt’s resurgence saw them pip Nigeria to qualify for Gabon 2017, a good omen for their Afcon 2017 title winning ambition. Mali meanwhile have never won the African title. The closest they came was playing in the final in 1972 which they lost narrowly to the Congo (3-2), but they have qualified for the last five editions, even making it past the group stages regularly, but making the final again, has eluded them. Alain Giresse, in his second spell with the side will have to do without Seydou Keita this time out after the Malian legend retired from international football. Mali will hope to better their third place finish in 2012 in Gabon and will rely on the midfield-their biggest strength, to carry them through. Weder Bremen’s Sambou Yatabare and Monaco’s Adama Traore are the main men in the middle who pull the strings in the middle.Gent’s giant striker Kalifa Coulibaly, Bakary Sako from Crystal Palace will lead the front-line hoping to get the goals that will shock Egypt and set Mali’s campaign off to a good start. -- The only previous Cup of Nations game between the countries was the 1978 final which hosts Ghana won 2-0 in Accra thanks to a brace from Opoku Afriyie. -- They did clash, though, in a 2018 World Cup qualifier just three months ago with Uganda forcing a surprise 0-0 matchday 1 draw in Ghana. -- Ghana hosted and won the Cup of Nations in 1963 and 1978 and also triumphed in 1965 in Tunisia and 1982 in Libya. Uganda came closest to glory in 1978 by finishing runners-up. 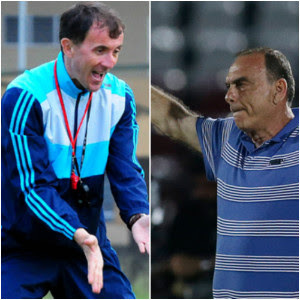 -- Both teams have foreign coaches with Israeli Avram Grant, the former Chelsea and West Ham manager, coaching Ghana and Serb Milutin 'Micho' Sredojevic handling Uganda. -- The Black Stars of Ghana are ranked ninth in Africa and 54th in the world while the Cranes of Uganda are 18th in Africa and 73rd in the world.